For the pastry, mix the plain flour, self-raising flour and butter. Add a splash of warm water and knead well until it makes an elastic dough. Form the dough into small balls and roll each out into a circle. Cut each into two half-circles (you should have about 24 half-circles in total). Cover with a clean tea towel and set aside. For the filling, heat the cooking oil in a frying pan. Add the red onions and panch phoran and fry until the onion is golden-brown. Add the spinach and chilli, and season with salt. Cook the mixture over slow heat, stirring regularly, until the spinach has wilted. Take off the heat and add cheese, to taste. Add a teaspoon of the filling to the middle of each semi-circle of dough and fold into a triangle. Repeat to use up all the dough and filling. Half-fill a deep, heavy-based pan with vegetable oil and heat until a breadcrumb dropped in sizzles and turns golden-brown in 30 seconds (CAUTION: Hot oil can be dangerous. Do not leave unattended). 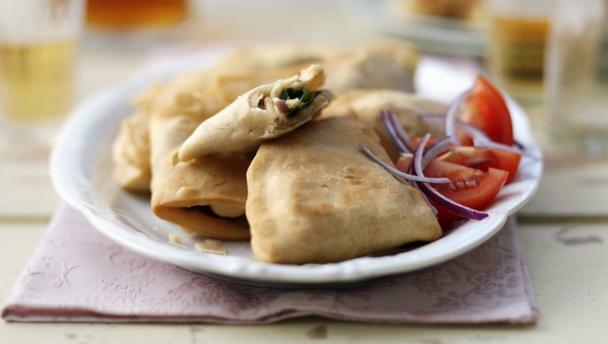 Fry the samosas in small batches for 4-5 minutes, or until golden-brown and crisp. Remove from the oil with a slotted spoon and drain on kitchen paper. Serve.